Skyline Communications reached new heights again in 2016, as adoption of the firm's DataMiner multi-vendor, end-to-end NMS/OSS software technology continues to gain traction around the world. With a growth of 35 percent in sales in 2016, and effectively tripling sales over the course of the last three years, the company further strengthens their thought leadership in the field of advanced, next-generation NMS/OSS software for the media industry. The company was also listed for the third consecutive year in the prestigious Deloitte Fast50 ranking as one of the fastest growing tech companies, and recently announced its plan to hire over 100 new talents to further support its continuous growth in 2017. Ben Vandenberghe, the CEO at Skyline Communications, reported that the company has experienced continued growth across all geographical areas and in all the individual media industry segments that the firm serves. The scales of deployment keep on increasing very rapidly. Consolidation of the industry, seismic shifts in its business models and consumer expectations, the need to drive down operational cost and simultaneously increase quality of experience... it all continues to fuel the need for sophisticated end-to-end network management and orchestration software, and DataMiner has become synonymous for that in the media industry. Recent technology transformations, including major waves of virtualization, make DataMiner an even more indispensable strategic asset for cross-vendor and cross-technology end-to-end orchestration. 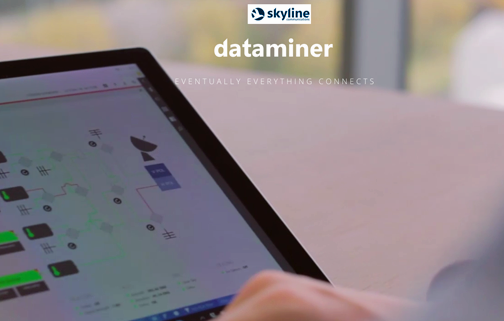 DataMiner effectively enables operators to harness the complexity of today's technology ecosystems, while at the same time enabling them to unlock their systems’ true potential and flexibility with its powerful orchestration capabilities. While in the past the solutions and business models offered by customers were pretty much hardwired and locked into their underlying technology infrastructure, there is now an increasing shift towards the overarching end-to-end DataMiner software platform, which serves as the single pane of glass for end-to-end orchestration of the entire operation. DataMiner was selected for DVB-T2 in Germany and deployed for the world's largest DTT network by RTRN in Russia, and this after earlier deployments in Vietnam, the Philippines, Singapore, Australia, Norway, Belgium, etc. DataMiner Occasional Use solutions for file and live exchanges are the choice of leading providers such as Fox, NBCU, Olympic Channel, Al Jazeera's global media cloud, British Telecom and EBU News network, just to name a few, was the comment from Steven Soenens, the Vice President of Product Marketing at Skyline Communications. He continued by stating that DataMiner has been elected to monitor and orchestrate state-of-the-art data centers for live, on-demand, cloud DVR and dynamic ad insertion services for one of the largest telecom providers in US. More than 80 percent of satellite operators have deployed DataMiner, and the impact there continues to grow massively, fueled by the product's innovative solutions that enable new services over satellite, such as OTT video delivery, new business models such as VNO, and new GEO multi-spot beam and LEO constellations. DataMiner solutions are endorsed by more key technology and system integration companies than ever before. At present, in each of the market segments, the company has technology integration programs and supply agreements with the vast majority of companies leading the industry to the next evolution.